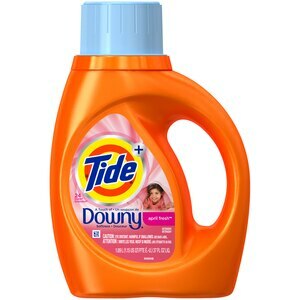 Tide with Touch of Downy liquid laundry detergent combines Tide s powerful cleaning and freshness with the color protection of Downy. It is loaded with softening ingredients to add a smooth layer of comfort to the fibers in your fabrics. It is now more concentrated to provide more stain removal and freshness and less water**. From America s #1 detergent*** to cover your many laundry needs. Also try our small but powerful Tide PODS laundry pacs. Measure your loads with cap. For medium loads, fill to bar 1. For large loads, fill to bar 3. For HE full loads, fill to bar 5. Add clothes, pour into dispenser, start washer. *Based on stain removal using 1 dose Tide HE in the quick wash cycle vs. 10 doses of the leading bargain liquid detergent, base variant, in a normal wash cycle. **vs. previous formula. Tide + Downy liquid detergent offers Tide s powerful cleaning and freshness plus the color protection of Downy.